Would you like to run away to the Circus? Well join us on a little trip we want to call "Tenting The House"! You see, we have by this time boxed all our food that goes with us, all our clothes, and all the needs of the Parrot and the Dog. It went into the cars and brought about 3 blocks away. Almost precisely on schedule, which in Florida means about 30 minutes late, they arrived. We really did need the extra half hour to plan this anyway since we were still bagging things and showering and doing Normal Household Things when they got here. There arrived a box truck and this ... thing. It's sitting in the driveway. A truck full of things that I am sure I would have loved to explore if I had the time to. 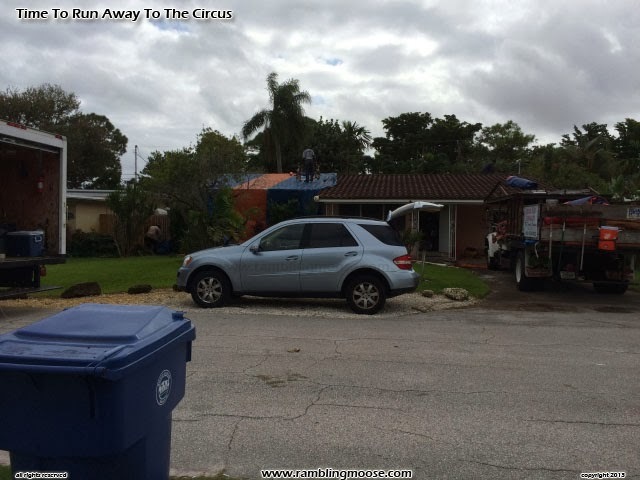 Clamps, water, tarpaulins, signs, and everything you would need to entomb your house in a giant circus tent. No loitering allowed, this place was going to be gassed. The truck has an upper deck that would allow the workers to step onto my rather fragile roof so they could do their thing. They arrived and began opening every window, drawer, and door. Everything had to be opened just enough so that the gas could get to it. That gas was Vikane gas, something related to what the Nazis used in the holocaust. It would be released in the house along with Tear Gas to deter anyone from entering the place. Why tear gas? 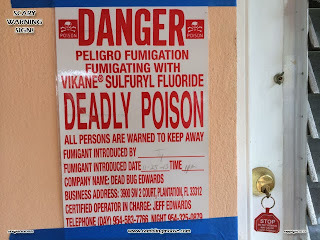 One of the dodges that criminals were doing in South Florida was to get scuba gear and go into these houses and basically empty them while the gas was in the place over night. Nobody would be there to see them do it and they did get away with some of the burglaries. Luckily these scum got caught and will be in jail for a while. The workers inspected the entire place, deemed it ready, then cleared away an area of about a foot from the actual footprint of the roof of the house. It needed to be clear so that the tent could be weighted down to the soil. Anything actually living within the perimeter of this zone of death would be killed over the next three days. It was Monday and we weren't allowed back until Wednesday morning. Over the next two hours, I watched my Orange Tree trimmed back since it was encroaching on the carport, watched my orchids and other potted plants relocated to the pool deck, and people swarm over the place like the ants that they were ejecting from the premises. It was fascinating to watch. People who were as large as myself on the roof stepping over tiles, handing down clamps and tarpaulins, and eventually wrapping the place up in cheerful blue and red. 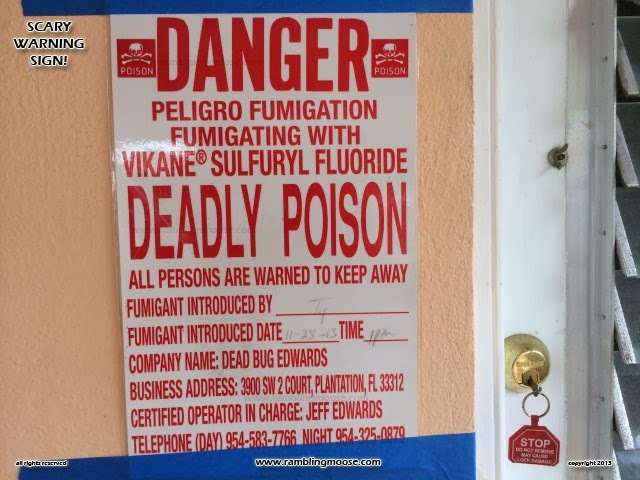 They finally affixed a sign to the place that pronounced that we were being fumigated by Dead Bug Edwards as we left for lunch. It was surgically precise. The house was professionally secured. The grounds were cleared. Things were prepared by people who clearly have been doing this for a long time.